It is the mission of Chesterfield County Council to improve the overall quality of life for our citizens by fostering a climate that is progressive in social, educational, and economic opportunities while keeping the safety of our citizens and protection of the environment first and foremost. Chesterfield County Council will strive to provide leadership to all segments and sections of the County while promoting unity and equal treatment to all of our citizens. Chesterfield County Council will seek to ensure citizen participation in the governance of our County as we work to deliver the highest quality of service in the most cost efficient, effective, and accountable manner. 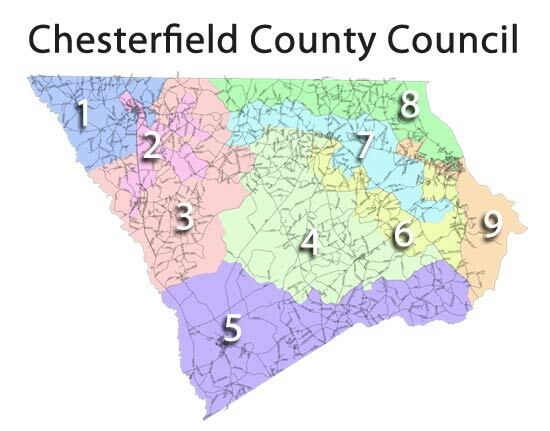 Chesterfield County Council is comprised of elected officials from nine-single member districts. All council members serve four-year staggered terms. Chesterfield County operates under the Council/Administrator form of government. Under this form of government, County Council determines policies which are implemented under the direction of an appointed County Administrator. Chesterfield County Council meets the 1st Wednesday of each month with the exception of holidays. Meetings are held in the Council Chambers, 178 Mill Street, Chesterfield, SC. Meetings will begin at 9:00 a.m. Prior notification will be provided Council for any change to the dates and time of meetings. Special Called Meetings may be held at any time with a twenty four hour notice provided to the public by notice on the County website and a notice on the door of the Council Chambers. All meetings are open to the public with the exception of Executive Session. Should any person, group, or organization request to be heard upon any matter at a regular or special meeting of Council, such person, group, or organization shall submit a written request to the Chair of County Council to be placed on the agenda for meeting at least eight (8) days prior to the date set for such meeting. The request shall specifically state the reason for the appearance. The written request should be sent to Susie Boswell, Clerk to County Council, 178 Mill Street, Chesterfield, South Carolina 29709. The request can also be emailed to Susie at sboswell@shtc.net or faxed to her at 843-623-3945. Bruce E. (Eddie) Rivers, was elected in 1988 to represent the western side of Chesterfield County, District 1. Eddie and his wife Debra have three sons. He and his wife are active members of First Baptist Church. He is a retired businessman (owner and operator Pageland Cleaners & Laundry). He is also Fire Chief of Pageland Fire Department, Charter and Life Member of Pageland Rescue Squad, Central High School Athletic department, Pageland Community Assistance, Chesterfield County Disaster Relief Team and an active volunteer in the community. Kenneth A. (Al) Johnson , a native of Jefferson, was elected in 1987 to represent the western side of Chesterfield County, District 3. Al and his wife Marsha have three children. Mr. Johnson is a SC Registered Land Surveyor. Benjamin K. Teal was elected in 2016 to represent County Council District 5. Mr. Teal is a tobacco farmer who resides in the Plainview Community of Patrick. He is a graduate of Horry-Georgetown Technical College with an Associate Degree in Forestry Management and a 2010 Graduate of Clemson University with a B.S. Degree in Agricultural Education. Mr. Teal serves as a member on the County Farm Bureau Board of Directors along with serving on the South Carolina Tobacco Board of Directors. Hattie Burns was elected in 2016 to represent Chesterfield County Council District 6. She and her husband, Wilbert, are the parents of three sons and one daughter. They are active members of Macedonia Baptist Church and work diligently in their church and community. Hattie is a retired educator of the Chesterfield County School District. Ralph E. Watson was elected in 2016 to represent Chesterfield County Council District 7. Mr. Watson is married to Karen Atkinson Watson. They have two children and two grandchildren. He is a licensed residential contractor and the owner of Classic Builders. He studied Architecture at Georgia Tech. Mr. Watson is a member of Chesterfield Baptist Church and the Chesterfield Lions Club. William R. Butler was elected in 2016 to represent Chesterfield County Council District 9. Rhett and his wife, Marcia, have two children. Rhett is a graduate of Clemson University and MUSC College of Pharmacy and is a retired pharmacist and businessman.